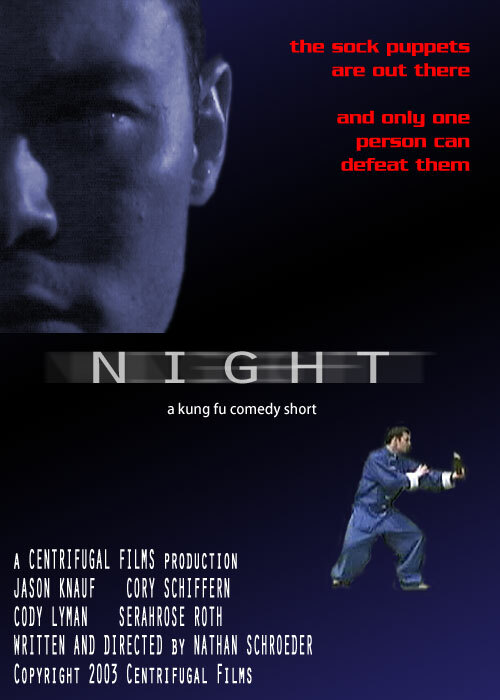 Night was shot in Chicago in August of 2003. It was part of a comedy film competition where the participants where given a word drawn from a hat and then had exactly one week to brainstorm, write, shoot, and edit a short video. Our word, obviously, was "night," and I remember we got this news just as I was about to fly to Colorado for a visit. I had recently finished a book on editing (In the Blink of an Eye? ), and one thing that struck me was how each shot should ask a visual question, and the next answer it, and so on until the viewer was drawn into the story. I started with a simple list of freely associated words based on "night." Sleep, dreams, nightmares, dark, light, etc… From this I had the idea of a guy who couldn’t sleep, or wouldn’t sleep. Why? The shot list practically wrote itself from there: Why are cans of energy drink laying around? Oh, he’s been drinking them all night. Why is he drinking them? He doesn’t want to fall asleep. Why not?? Why not, indeed. Watch to find out! This video stars some of my best friends from Chicago, and more were involved in the production. We discovered to our great excitement that Jason is amazing and natural on film, and has this innate ability to take very sparse dialog (one week, remember!) and tell the whole story with it. He and Cory were also great fun to work with on the action scenes, with Jason in particular tapping into his inner kung fu master. CF was started by Nate in '02 as a vehicle to learn how to shoot, edit, and produce digitial video. An hour-long feature remains in perpetual "editing" mode, but may someday see daylight. In the meantime, enjoy these other offerings!